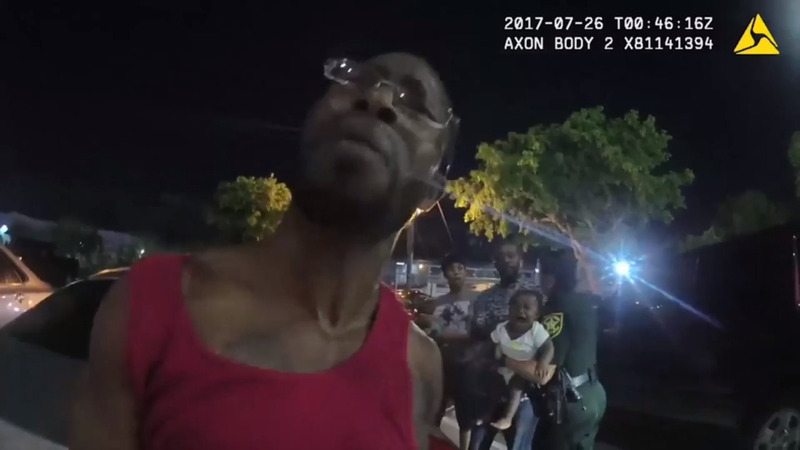 The father, Allen Floyd, was holding his 9-month-old child while sitting on a curb outside a Dania Beach motel as BSO Deputy James Cady demanded Floyd produce identification amid foul language. When Floyd, who wasn’t under investigation, rose to walk away from Cady, the deputy grabbed the man’s arm, then appears to grab his throat as Deputy Debbra Bridgman took the father’s child from his arms. Floyd wasn’t charged with a crime after the incident. He didn’t file a complaint about Cady. The Broward Public Defender’s office filed a complaint Jan. 30 after discovering the video while preparing to defend Johnnymae Dardy, who had been babysitting Floyd’s child earlier in the evening. On Feb. 1, Broward Sheriff Gregory Tony had sent a letter to the public defender’s office, thanking the office for letting him know about the incident, noting no complaint had been made, and stating there would be an investigation. Via its Twitter account Monday, BSO issued this statement: “Recently, we received a video from 2017 of Deputy James Cady that has been circulating the Internet. We want to thank the Broward County Public Defender office for bringing this matter that occurred in July 2017 to our attention. It is currently being investigating by our Division of Internal Affairs. BSO said, as of Monday, Cady was still working his normal shifts during the Internal Affairs investigation. Bridgman retired March 31 last year. Bridgman wrote the probable cause affidavit, which in this situation would be written by the arresting law enforcement officer before turning the person arrested over to jail personnel. The affidavit needs to detail only Dardy’s actions that led to the charges being filed. That’s what it does, and that’s all it does. Bridgman’s narrative confines itself strictly to Dardy and the alleged actions against Bridgman and a “Deputy Ordoz” for which Dardy was charged originally (two counts of assault on an officer, one count of child abuse without great bodily harm, one count of resisting an officer with violence). Only the last charge remains. The affidavit doesn’t say why the deputies were called to the Red Carpet Inn, as many other affidavits do. There’s no reference to any interaction with Dardy, why Floyd’s child was removed from Dardy’s custody or why deputies ordered her to sit in a car. There’s no reference by name of Floyd, the father of the child allegedly abused, Cady or their encounter.